The Toronto Feral Cat Coalition is a coalition of municipal animal controls, humane organizations, and rescue groups, working collectively to improve the lives of feral cats through strategic TNR programs and to address the numbers of homeless and feral cats living on the streets. In the spring of 2010, Toronto Animal Services announced the opening of a new spay/neuter clinic and that they would sterilize feral cats for free on specific days each month. This amazing breakthrough was the catalyst that formed the Toronto Feral Cat TNR Coalition. 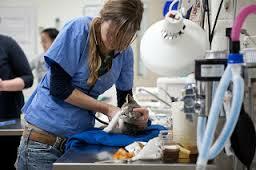 Later in 2010, Toronto Street Cats through the Toronto Humane Society, also began offering free spay neuter clinics for feral cats. prior to and following surgery. Feedback from colony caretakers identified the lack of recovery space as a significant obstacle to TNR efforts. This feedback pushed the City and the Coalition to address the shortfall of a space to recover cats. In early December 2012, the Recovery Centre opened in a City of Toronto complex in central Scarborough, close to the Feral Spay Neuter Clinic at the Toronto Animal Services East Shelter. Here, volunteers from Toronto Cat Rescue provide a safe and healthy space for feral/stray cats to recover from their spay/neuter surgery, prior to being returned to their colonies. Besides the important work of providing a safe and secure place for cats to recover from spay neuter surgery, the Centre also has a trap bank to provide traps to colony caretakers and trappers who do not have access to them otherwise.